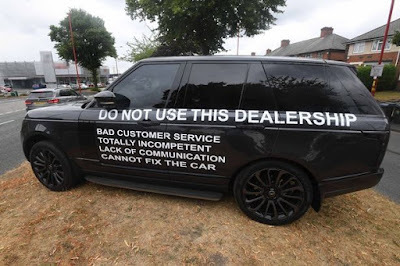 A furious car owner has explained why he defaced his own £63,0000 Range Rover before dumping the luxury vehicle outside a dealership. 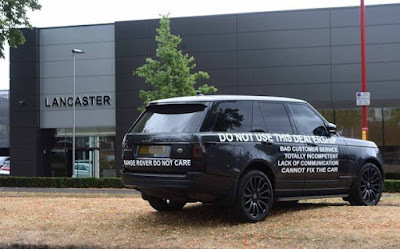 The black Range Rover Vogue was plastered in the customer's complaints about the service he had received from staff at the Lancaster Land Rover Branch, in Birmingham. The father-of-two, who wished not to be named, left the car in clear sight of thousands of other motorists after abandoning it on a central reservation in Erdington. It was adorned with alleged complaints which strongly urged others to avoid the dealership. 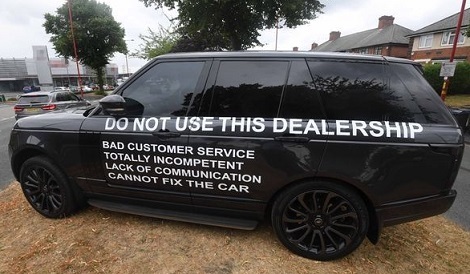 They claimed: "Range Rover do not care. Do not use this dealership. Bad customer service, totally incompetent, lack of communication, cannot fix the car." Now the motorist has come forward to talk about the vehicle, which he had bought for his pregnant wife. The dad-to-be, who did not wish to be named, said: "I bought the car from Land Rover on Tyburn Road and they had given me a three year warranty. "I bought the car for my pregnant wife and as a present for the new baby." He claims days after buying the Range Rover there were problems with the engine oil and air bags. He added: "I was on hold on the phone for five and a half hours when I first complained a week and a half ago. "Nothing was being done. "So I went to a specialist graphic designer to mark the car with the words I wanted. "Then I decided to park it outside the dealership as I thought 'I'm not going to let this happen to anyone else'." "I've since been contacted several times by the dealership. "They've even offered me free champagne, but I don't drink. All I want is for them to fix the car." "We're in disputes at the moment. But I have given them the spare key and said 'bring it into the garage, fix it and drop it back off outside my house'."